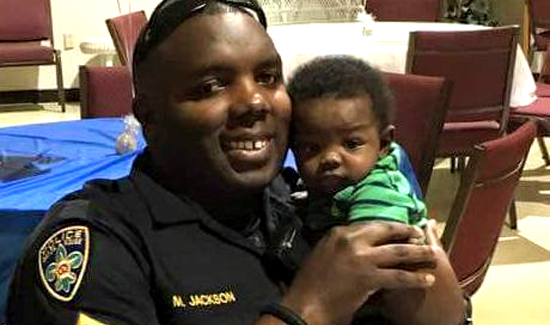 A Baton Rouge policeman who was once injured trying to save a toddler from a burning building and recently welcomed a son of his own was one of the three officers killed in a Sunday morning shooting. A cousin and family friend said Sunday that Montrell Jackson, 32, a 10-year-veteran of the Police Department was one of the officers killed. Also, three other officers were wounded in the shooting. During a news conference Sunday with Gov. John Bel Edwards and law enforcement, Baton Rouge Police Chief Carl Dabadie and East Baton Rouge Sheriff Sid Gautreaux only identified their officers involved in the shooting by their ages: a second Baton Rouge officer, 41, and one deputy, 45, were killed; and two deputies, 41 and 51 years old, and one police officer, 41, were wounded. Gautreaux said the 41-year-old deputy was in critical condition. Last month, Jackson had his 10th anniversary with the Baton Rouge Police Department, according to online city records. “He loved his job,” said Darnell Murdock, one of Jackson’s friends. The officer recently welcomed a son, Murdock said.